This month, we feature “Sabroso,” Edgardo Saldana’s “delicious” ’63 Chevy Impala from Rollerz Only C.C. in Chicago, Illinois. Traveling the nation, we get to see many of the nicest custom vehicles around. Take Ed’s completely done-up ’63 Impala. We spotted this orange pearl Impala at its debut at last year’s Denver, Colorado, Tour show. It just needed a few final touches and then it would be ready for our From The Hood section. Ed found the time to tie up those loose ends and we caught up with him to show you his custom engine compartment. Ed started with one builder and stuck with him through thick and thin. But then, Bob “Hollywood” Wagner and his star staff at Hollywood Kustoms in Northlake, Illinois, aren’t just any builder. They took this project to a highly competitive level. They hooked up an ’88 tune-port-injected 350-c.i.d. engine, painted to match the exterior of the vehicle. All of the wiring was hidden to keep the engine compartment looking clean. Bob made some custom motor mounts to hold the power plant in place, and also built a custom firewall panel to further enhance the engine. Anything that was able to be polished or chrome plated was sent out to the plating shop where it was given a show finish. Pinstriping was added as an accent to the paint and chrome. Hollywood Kustoms took a year and a half to put this car together, with a major part of the build concentrating on the engine compartment. Ed told us that it was well worth the wait. We think so, too. Keep your eyes open for a full feature on Ed’s ’63 in the near future. If you feel that you have an engine worthy of our From The Hood section feel free to contact us at saul.vargas@primedia.com. 1. A Be Cool radiator and Spal fan keep things cool under this hood.2. 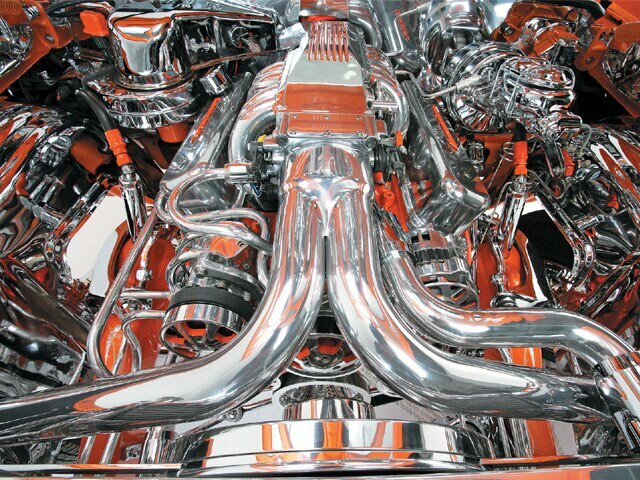 Custom-made radiator hoses match the custom cold air induction intake.3. A Billet Specialties serpentine pulley system keeps things humming.4. The molded frame matches the exterior.5. A chrome master cylinder and booster provide better stopping power.